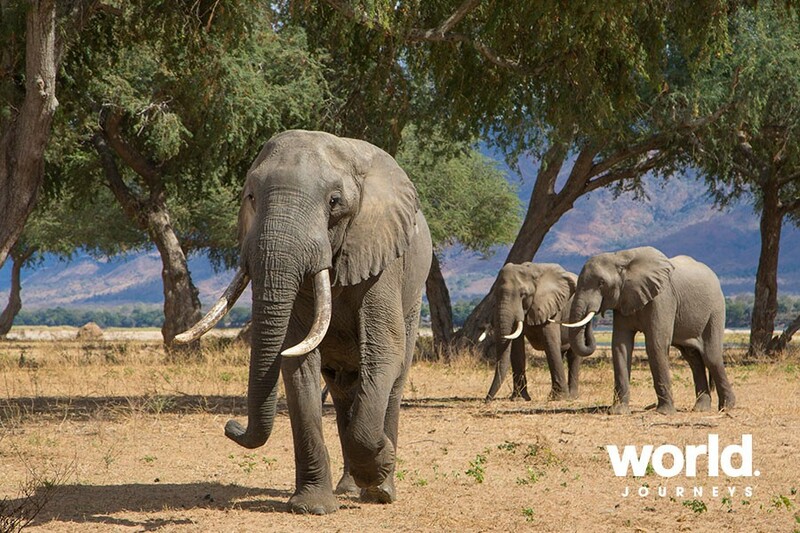 Experience three of the major highlights of Southern Africa has to offer. 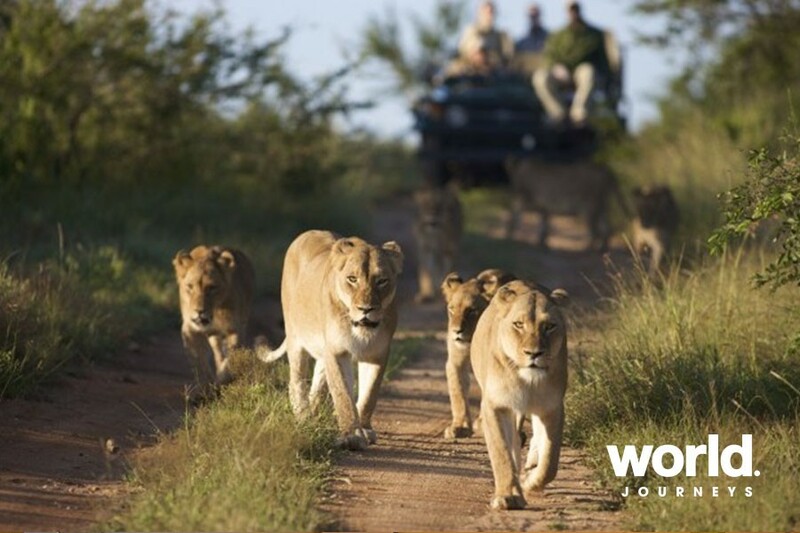 Explore Cape Town, the 'Mother City' and the world renowned Kruger National Park, home to Africa's iconic safari species - elephant, lion, leopard, cheetah, rhino, buffalo, giraffe, hippo and zebra. The diversity and sheer number of different animals is unparalleled. 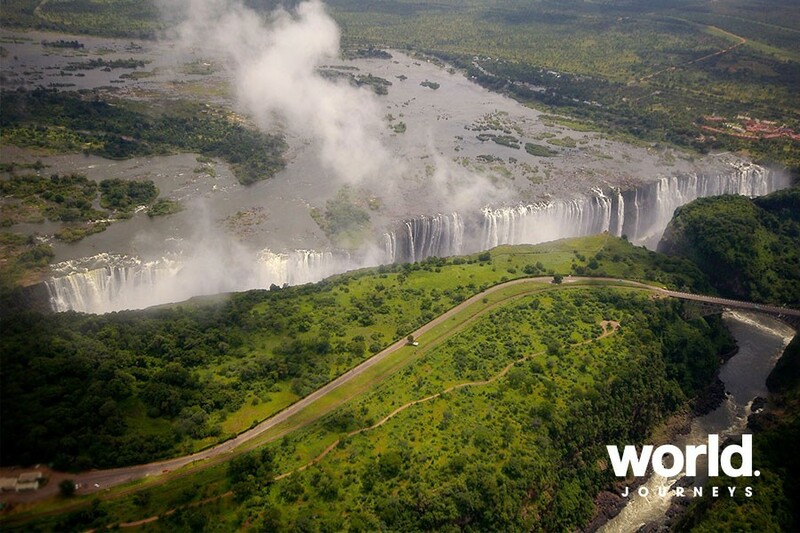 Conclude your safari visiting one of the Seven Natural Wonders of the World, the magnificent Victoria Falls. Day 1: Cape Town On arrival you will be welcomed to Cape Town and private transferred to your hotel. This evening explore the vibrant Victoria & Alfred waterfront at your leisure. 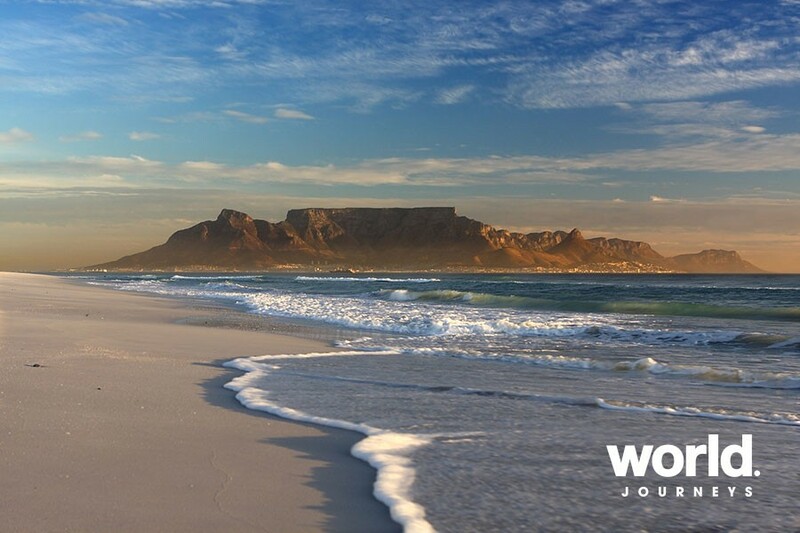 Days 2 & 3: Cape Town Take a half day city tour and visit iconic Table Mountain. The next day enjoy a full day excursion to the beautiful Cape Peninsula. Day 04 Cape Town > Kruger National Park Fly to Kruger. You will be met and transferred to your private safari lodge for a three day Kruger safari. 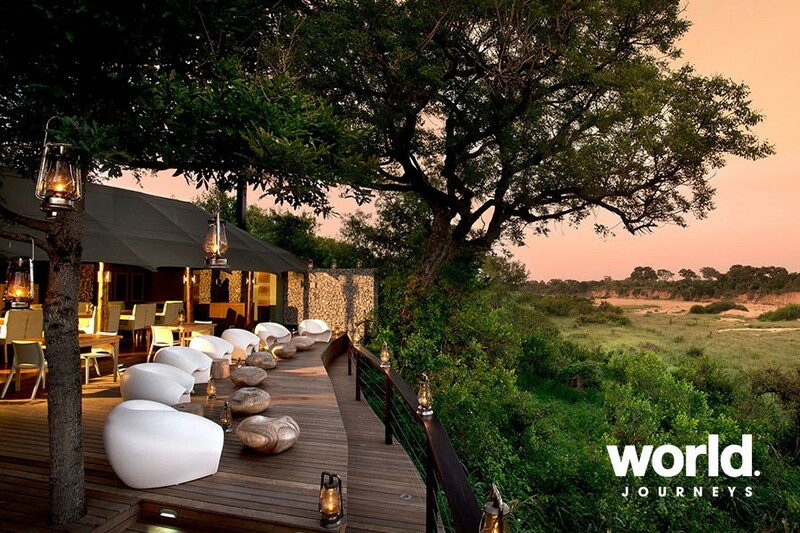 The greater Kruger area including the National Park and private concessions is wildlife-rich and you will be able to track the Big Five plus more! Days 5 & 6: Kruger National Park Area Enjoy morning and evening game drives in search of the 'Big Five' and a host of other species. 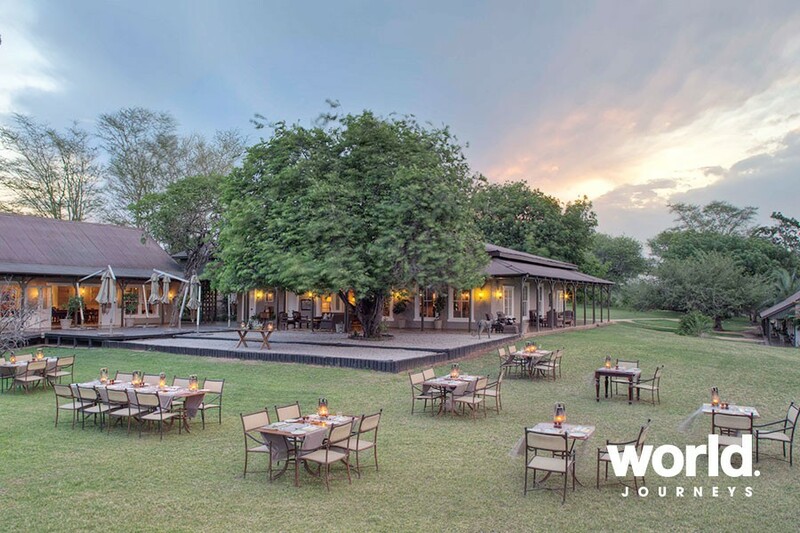 The greater Kruger area is wildlife-rich and you will explore the area on shared safaris within private concessions and in the Kruger National Park. Day 07 Kruger > Livingstone > Victoria Falls Fly from Kruger to Livingstone in Zambia. On arrival enjoy a guided tour of the falls on the Zambian side, before transferring to your hotel on the Zimbabwe side. Marvel at the thunderous, cascading sheets of water! Day 8 & 9: Victoria Falls The Falls tour takes you through rainforest pathways to many viewpoints including the Devils Cataract, Cataract Island, Rainbow Falls, Eastern Cataract, Danger Point and Boiling Pot. There is plenty of time at leisure for optional activities such as a bungy jump, Zambezi cruise or helicopter flight. 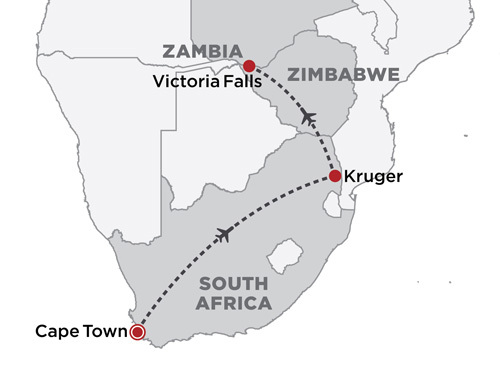 Day 10: Victoria Falls Transfer to Victoria Falls Airport for your onward flight. 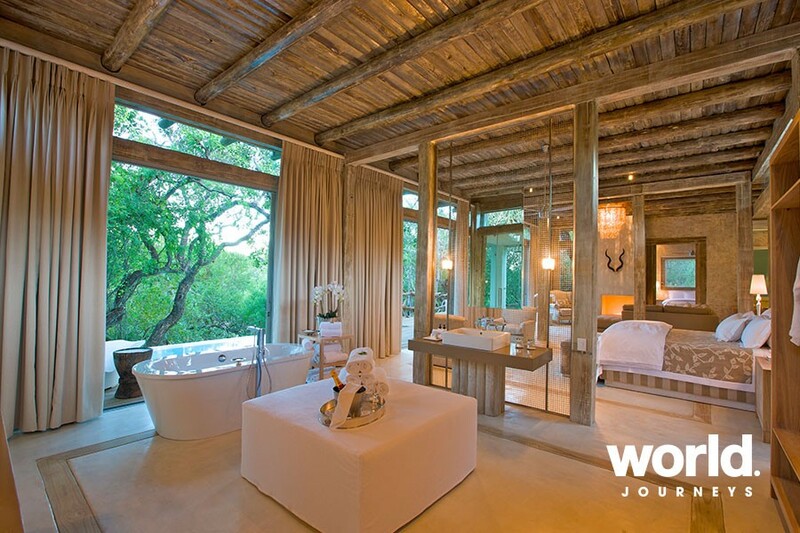 Prices are based on the lowest season available and include flights between Cape Town, Kruger and Livingstone. Single pricing is based on minimum 2 travelling. Please contact World Journeys for pricing on your specific dates of travel. Enquire for pricing on your specific date of travel.